A popular street art festival will make its second appearance in Birmingham next year after doubt clouded whether it would go ahead. 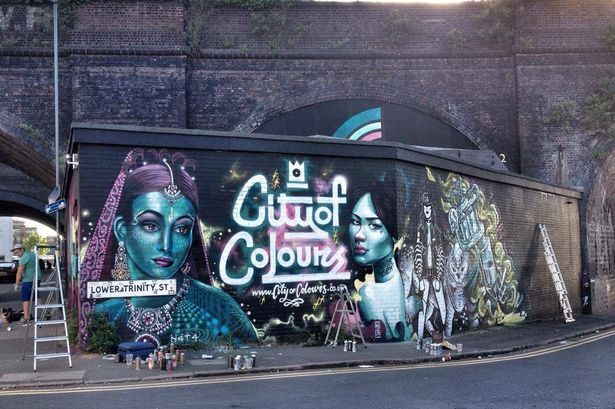 The inaugural City of Colours was held in Digbeth in September 2014 and attracted around 9,000 people to the free one-day event. Organiser Becci Wright has now confirmed the second festival will take place on June 18, 2016. The first was so successful that Ms Wright initially planned to host the 2015 version over two days before deciding to revert to the original one-day format. In May, a crowdfunding campaign was launched on the Kickstarter website to raise £15,000 to support the £85,000 running costs but this only raised £3,529 meaning it did not receive a penny as it failed to hit the target. After much deliberation, the event planned for September this year was postponed in June due to a £35,000 shortfall in the budget but Ms Wright has now confirmed a definite date for City of Colours to return. A series of events are set to take place in the meantime in a bid to raise funds to buy equipment for the festival with the first taking place next weekend. Ms Wright said: "After delivering the unfortunate news of postponing City of Colours earlier in the year, I&apos;m pleased to share the team are making plans for another festival. "As a free festival, the next few months are crucial for us, making sure we source enough funds to make the event happen. "As well as grant funding, we are also looking for a number of sponsors and fund-raising from the public will be another key income stream. "Although we won&apos;t be carrying out another Kickstarter campaign, we will be delivering a series of exciting fund-raising events and initiatives over the coming months to help us reach our £5,000 target." Ms Wright said collecting £5,000 would enable organisers to buy 1,700 spray cans which is the average number needed for the event&apos;s 100+ artists. The first City of Colours welcomed both internationally acclaimed artists and visitors from all over Europe to Digbeth and hosted street art workshops, dance classes and live demonstrations at venues across the district. A &apos;Winter Jam&apos; to raise money for next year&apos;s festival is being hosted on December 5 at The Old Crown, in Digbeth, and will include an auction of art work at the end of the day.